To the left, you can see what the destination city is, for the job. A deliver job can be delivered when you enter the destination city or you have to deliver it at the governor, merchant or pub. You can see where to deliver it, at the task description. Deliver packages do not have high special requirements, for you to take the job. You can see what is required to take the job, by clicking it. 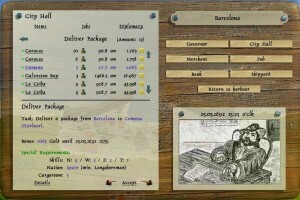 Deliver package also gives a bonus gold, if you deliver the job within the time limit. If you do not complete within the time limit on the job, you gain no navigation bonus. The shorter time you use for delivering the job, the higher navigation bonus you will get. Note that some deliver package jobs, you need to pick up the package at another city, then the city you took the job at. These jobs pay an average amount of gold. Hint: deliver package is best done in sloops, as they are the fastest ship. You can buy fast ships in the store here.